We’re pretty sure all the hackers and tinkerers and makers out there were a tiny bit of a pyromaniac in their youth. That’s what makes this week’s Hack Chat so exciting: we’re talking about Hacking With Fire. 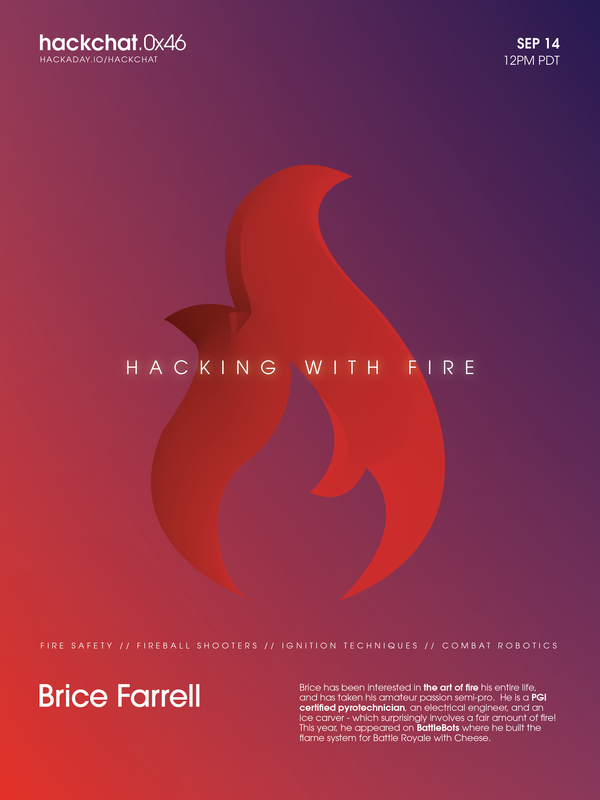 Our guest for this week’s Hack Chat will be [Brice Farrell], who, like most of us, has been interested in fire his entire life. He’s taken this interest and turned his amateur passion into something semi-professional. He’s a PGI certified pyrotechnician, an electrical engineer, and an ice carver. This year, he appeared on BattleBots where he built the flame system for Battle Royale with Cheese. Given [Brice]’s extensive expertise, this Hack Chat is going to cover the relevant safety concerns of work with fire, how to keep yourself safe, and how to do everything legally. We’ll be talking about fireball shooters of all sizes, ignition techniques, and the use (and introduction) of fire in combat robotics. That last point is extremely interesting: is fire on a BattleBot actually useful, and what can you do to protect your bot from it? Our Hack Chats are live community events on the Hackaday.io Hack Chat group messaging. This week is just like any other, and we’ll be gathering ’round our video terminals at noon, Pacific, on Friday, September 14th. That’s not the same in every time zone, but don’t worry, we have some amazing time conversion technology. [visualkev]’s friend was putting on his own fireworks show by lighting each one in turn, then running away. It occurred to [visualkev] that his friend wasn’t really enjoying the show himself because he was ducking for cover instead of watching the fun. Plus, it was kind of dangerous. Accordingly, he applied his hacker skills to the challenge by creating a custom fireworks sequencer. 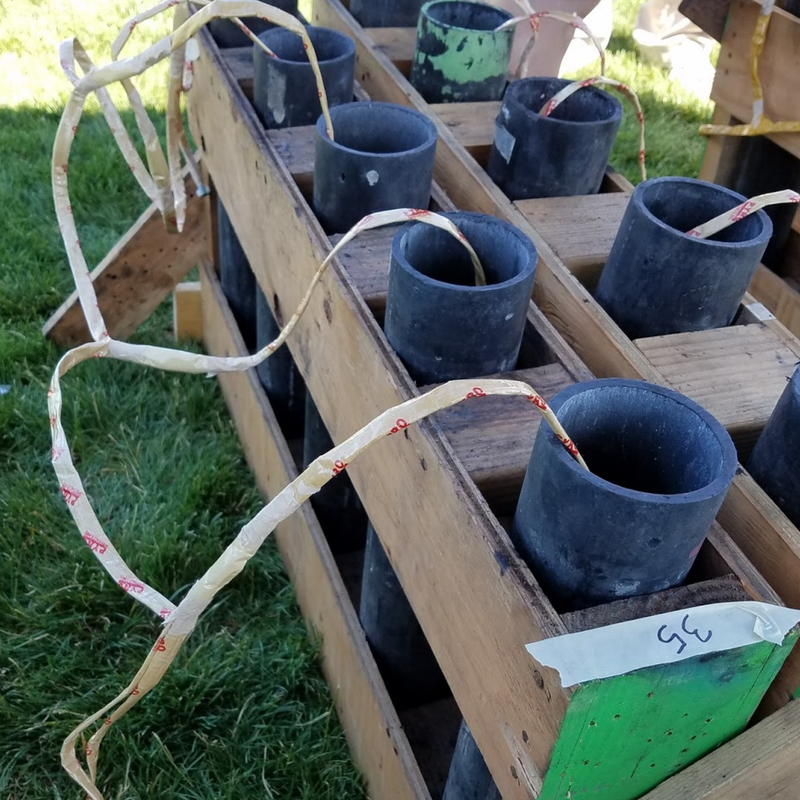 He used a custom PCB from OSH Park with an ATMega328P controlling eight TPIC6C595 8-bit shift registers, which in turn trip the 64 relays connecting to the fireworks. A 5V regulator supplies the project from 5 5AA batteries, and he kept the wires neat with 8-wire ribbon cables. Starting the sequence is a generic wireless remote — a cheapie from Walmart — allowing [visualkev]’s friend can launch the fireworks with one hand while working the barbecue tongs with the other. This week, [Chris] tips the scales but ultimately fails. He’s on the road, hacking through the Great White North and improvising from a poorly-lit echo chamber that happens to have a vise. Knowing nothing about firearms (do you believe that? ), he decided to build a BB cannon out of pure scrap. Several kinds of sparks fly, starting with a Hitachi drill-as-lathe and ending with a tiny cupcake sparkler. [Chris] proceeds to bore out some redi-rod by eyeballing it and offers helpful tips for course correction should you attempt same. Having centered the cavity, he drills out a tiny hole for a fuse. His first fuse is of the crushed up match head paste variety. It burns kind of slowly and does not launch the BB. Naturally, Plan B is to make napalm glue to adhere Pyrodex pistol powder to paper. As you might imagine, it worked quite well. The wadding was singed, but still no joy. After packing her full of propellant, it still didn’t explode and merely burned out the blowhole. So, what gives? Insufficient barrel length? Should have used bamboo instead of redi-rod? Didn’t want it badly enough? Give us your fodder below. [Quinn]’s friends were getting married, and while the couple wanted something like a ‘unity candle’ ceremony, they though simple candles were entirely unimpressive and ultimately not very entertaining for the guests. They decided a unity fireball would be a much better representation of their relationship, and were lucky enough to have a good friend that could build one. 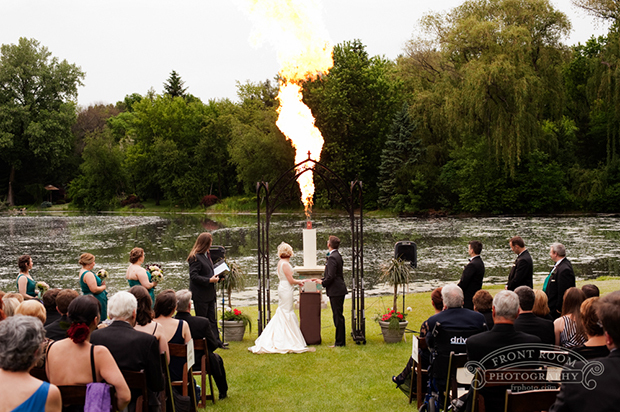 The design of [Quinn]’s unity candle consisted of a control box with two key switches, a giant button, and the gigantic propane fueled candle set well back from the bride, groom, and guests at the ceremony. The candle itself releases the entire contents of an accumulator tank over a hot surface igniter, creating a thirty foot fireball without a visible pilot light, or the loud jet-like sound you would get from a traditional ‘poofer’. As with all giant fireballs in front of an audience, safety was of the highest concern. [Quinn] didn’t use a full propane tank for this build, instead, a new, purged, and never used tank was used as an accumulator, storing just enough propane for one giant fireball. All the valves, regulators, and plumbing were rated for LP, and [Quinn] even filled out the proper forms and got the local fire department to sign off on it. It’s safer than [Caleb]’s Mario fire flower, but you still shouldn’t try this at home. Video of the ceremony below.